Congratulations to our RGC Mariachi Cascabel for earning 1st place and Division I ratings, at the Mariachi Vargas Extravaganza Mariachi National Competition on Friday December 3rd, 2010. They now hold the title of National High School Champions. 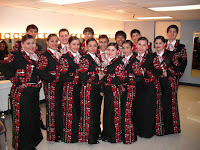 They had the honor to open for the best mariachi of the world- Mariachi Vargas de Tecalitlan on Saturday December 4, 2010 and represented Rio Grande City with great pride. In addition, they were recorded and interviewed by Univision-San Antonio and had the honor to perform at the Riverwalk in downtown San Antonio. The Univision record will come out soon during the Christmas Holidays. They will, soon, be part of the New York City Public Broadcasting System. Mariachi Cascabel was also interviewed by the Radio Station-Exa 95.1 on November 30th, 2010 and will perform and be interviewed once again this month. These students really worked hard and dedicated countless hours of practice to earn this Title. Once again, congratulations on a job well done on earning the National High School Championship. We would like to thank our parents and our community for their generous support. Mariachi Cascabel members are: Violins: Aleida Aguilar, Karla Iglesias, Maria Hernandez, Wendy Villarreal, Valentin Gomez, Stephanie Rodriguez. Trumpets: Javier Saenz Jr., Jaime Marroquin Jr., Jose Hernandez. Armonia: Gladys Marroquin, Mario Rodriguez, Adrian Garza, Beatriz Ramirez, Luis Barrera, and Linda Davila. The Rio Grande City High School Mariachi Cascabel is under the direction of Mr. Alex Rodriguez.